We are very excited to add Avril to our foundation herd! 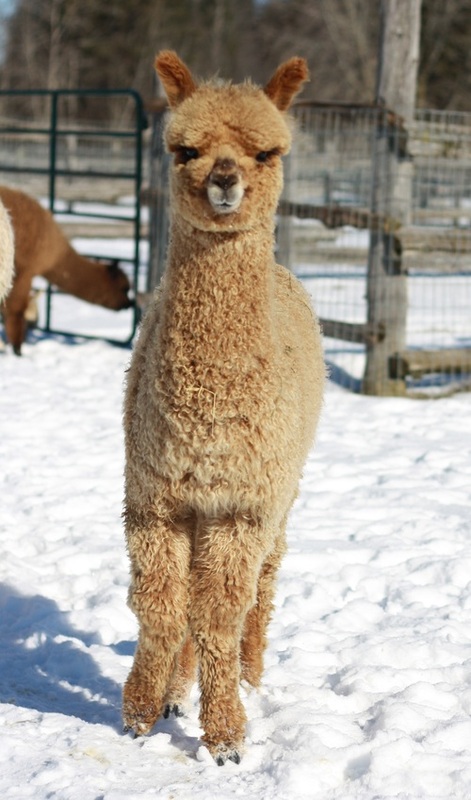 Avril is a reliable production female with amazing fleece characteristics! She has excellent density and crimp. Avril's first offspring was, Whoa Nelly Furtado, in 07 has been a supreme champion several times over. Avril had another girl, Lady Madonna, in 2008, a Reserve Champion. Love, Love this boy! 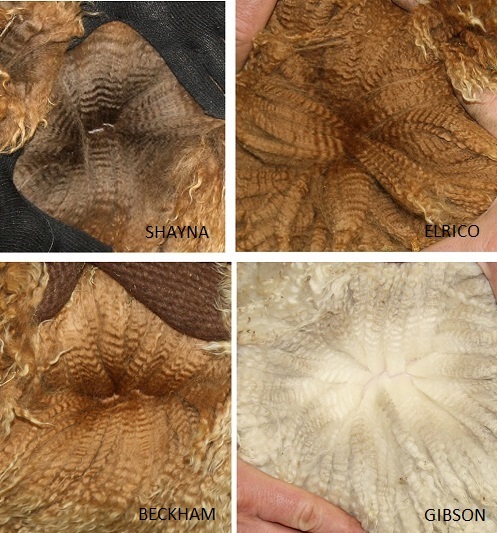 Gorgeous fibre, conformation and excellent genetics! He is The Whole Package! 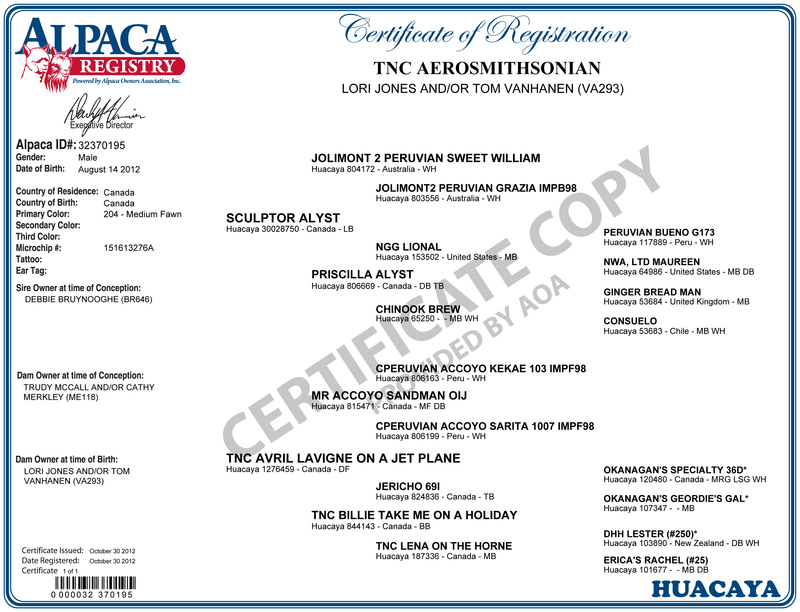 We purchased his dam Avril from TnC in 2012 because of her history of producing champions..at the time she just happened to be bred to Sculptor. The result is Aerosmith! 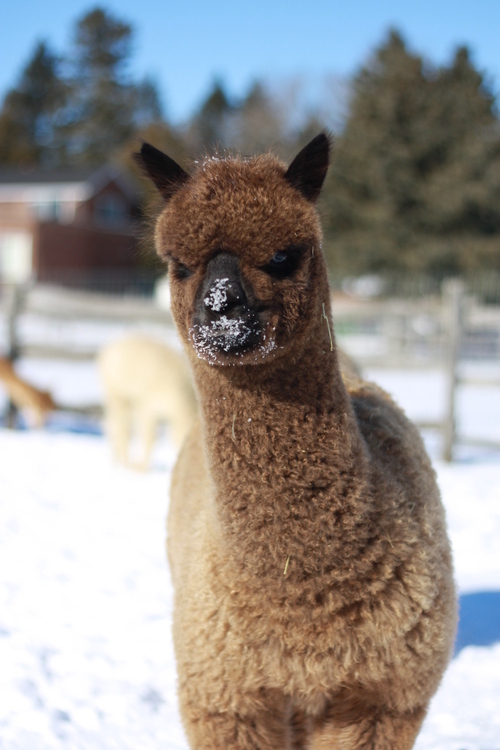 If you are looking for a male to boost your breeding program, take a look at Aerosmith. Aerosmith has started his breeding career. 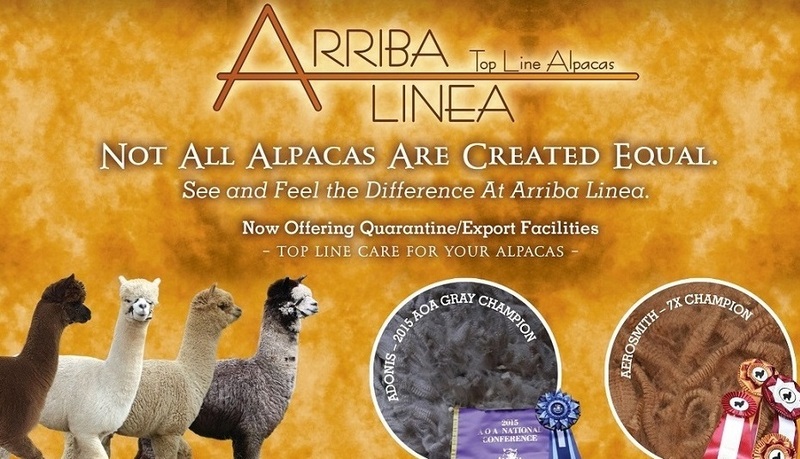 Watch for his crias in 2015! BEST IN SHOW - ROCKTON HALTER SHOW 2014! SUPREME CHAMPION - NAVAN HALTER SHOW 2014! SUPREME CHAMPION - NAVAN FLEECE SHOW 2014! JUDGES CHOICE - NAVAN FLEECE SHOW 2014! MILLER'S CHOICE - LLOYDMINSTER FLEECE SHOW 2014! FAWN CHAMPION - NAVAN FLEECE SHOW 2015! FAWN CHAMPION - LLOYDMINSTER FLEECE SHOW 2014! FAWN CHAMPION - ROCKTON HALTER SHOW 2014! FAWN CHAMPION - NAVAN HALTER SHOW 2014! FAWN CHAMPION - NAVAN FLEECE SHOW 2014! FAWN CHAMPION - ALPACA ONTARIO SHOW 2014!! 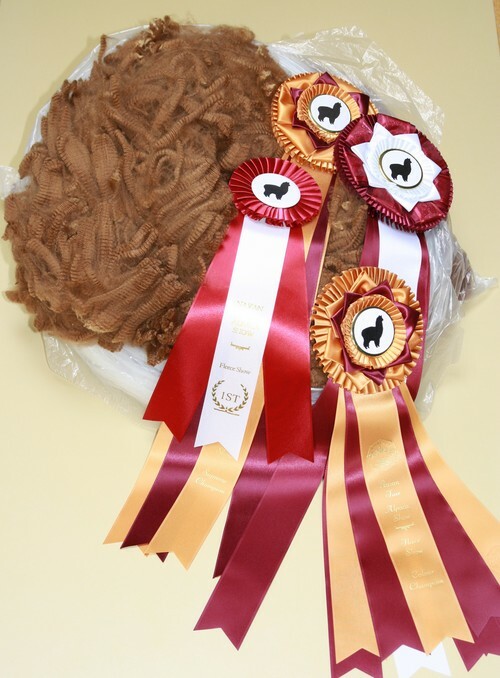 FAWN CHAMPION - ALPACA CANADA FLEECE SHOW 2013! HIGHEST SCORING FAWN - AOA SPIN OFF 2014! RESERVE CHAMPION - CNASFE 2013! 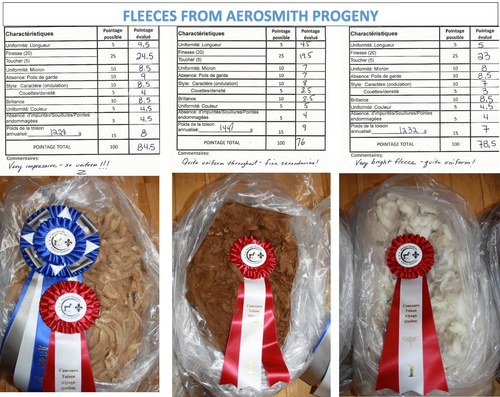 1ST PLACE - LLOYDMINSTER FLEECE SHOW 2014! 1ST PLACE - ROCKTON HALTER SHOW 2014! 1ST PLACE - NAVAN HALTER SHOW 2014! 1ST PLACE - NAVAN FLEECE SHOW 2014! 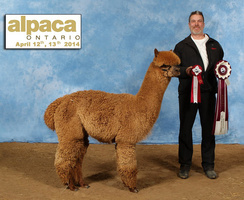 1ST PLACE - ALPACA ONTARIO SHOW 2014! 1ST PLACE - AOA SPIN OFF 2014! 1ST PLACE - ROCKTON SHOW 2013! 1ST PLACE - CNASFE 2013! 1ST PLACE - AC FLEECE 2013!